Speeds of 30 Mbit/s or more are now available to 83% of Scottish properties, up from 73% in 2015. This is the greatest increase in superfast coverage of all the UK’s nations. Many consumers in Scotland remain unable to access broadband with decent speeds. Around 192,000 homes and offices in Scotland – or 7% of premises – remain unable to sign up for broadband speeds over 10 Mbit/s, the speeds required to meet a typical household’s digital needs. This is often because they are situated a long way from the local street cabinet or telephone exchange. This is down from 354,000, or 14%, last year. 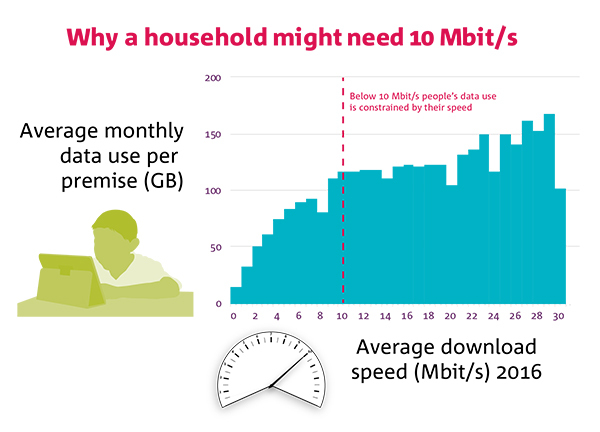 To help close this speed gap, Ofcom has today set out its technical advice to the UK Government on implementing its plans, announced in 2015, for universal broadband. So we have begun discussions (PDF, 41.9 KB) with mobile operators to look at radical and ambitious solutions to deliver universal mobile coverage, to keep pace with consumers’ needs. The average download speed of a broadband service in Scotland increased from 27 Mbit/s to 35 Mbit/s. This reflects not only better coverage, but also people choosing to pay for faster broadband packages. However, take up of superfast broadband remains relatively low despite the increase in availability. 27% of homes and offices in Scotland have an active superfast broadband connection compared to 83% availability. The increase in the availability of superfast broadband has been driven by BT upgrading its network; Virgin Media converting more homes to faster packages; the UK Government’s on-going Broadband Delivery UK programme and the Scottish Government’s Digital Scotland Superfast Broadband programme. Superfast services are now available to 73% of small and medium sized enterprises in Scotland – a considerable increase from 55% in 2015. Mobile coverage has also improved in the last year. Mobile voice services from all four operators can be accessed in 84% of Scottish premises while 75% now have access to mobile data services. However, it can be difficult to access mobile voice services in many areas of Scotland. Scottish consumers are unable to access mobile voice services from all four operators in approximately two thirds of Scotland's landmass (geographic voice coverage from all four operators increased to 36% from 29% in 2015). This should increase further following an agreement between the Government and all major operators to achieve better geographic coverage of voice services across the UK by the end of 2017. 4G rollout in Scotland has so far focused on urban areas. Geographic coverage of 4G networks from all four operators has increased to 12%, from 2% in 2015, but Scotland still lags behind the rest of the UK (40% in 2016). Ofcom rules mean that O2 must deliver a mobile data service to 98% of UK premises, and at least 95% in each of the nations, by the end of next year. Mobile phone users increasingly need coverage everywhere, so Ofcom is examining how regulation can help make that happen, and has called on network operators (PDF, 41.9 KB) to go beyond current targets by exploring options for reaching areas without premises – such as transport lines and remote locations.